James (KB0NHX) Don (N7BD) President TLARC, and Shawn (KE0JGI) President of NARC are pictured below. The Tri-Lakes Amateur Radio Club (TLARC) opened its training program to the community at the Taney County Emergency operations center in Hollister, Missouri this morning (2/16). 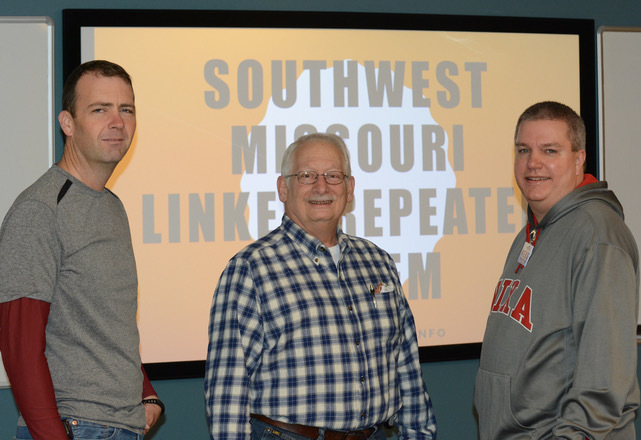 James Adkins (KB0NHX), Chief Field Technician, Missouri State Highway Patrol Communications Division presented information on the Southwest Missouri Linked Repeater System (SMLRS). The purpose of SMLRS is to enable amateur radio operators in the region's 3 largest metropolitan areas - Branson, Joplin and Springfield - to communicate among each other as needed during disasters and drills for the region. The system consists of 8 repeaters and provides mobile communications for most of the Region D area in Southwest Missouri. TLARC operates the VHF repeater on 147.195 Mhz and digital mobile radio (DMR) repeater on 147.150 Mhz frequencies. James later reflected, "It's Always great when you can teach folks about the link system, and get more people familiar with it!" After a couple of weeks of testing, the Cox South DMR repeater has been re-installed at Cox South Hospital and will be available for check-ins tonight for the Thursday Night check-in net held on the SMLRS and the Nixa ARC linked repeater Systems. On DMR, use the Southwest Missouri talkgroup 31291. Looks like the freezing rain/snow threat is going to stay to the north and east. Radar looks like precip is ending South of Springfield. We 're still on for the meeting tonight. Part 2 of the Nixa ARC repeaters.